Prior to becoming the successful power pop outfit Velvet Crush, the Ric Menck and Paul Chastain partnership were a couple of young lads unleashing their love of all things 1960's janglepop via bands such as The Springfields, The Big Maybe, Choo Choo Train, The Stupid Cupids, Bag O Shells and as members of Matthew Sweet's band. In fact they are probably best know for being the first international artists to ever be signed for pioneering labels Sarah Records (The Springfields) and The Subway Organisation (Choo Choo Train). Much of this early recognition and success was down to Menck who was a total musical anglophile and utterly conversant with every British label who were forging the new late 80's indie movements. As such he sent a tape to numerous British labels with Choo Choo Train tracks on one side and The Springfields tracks on the other, remarkably resulting in the two bands being signed at about the same time by the two labels (this the somewhat confusing overlapping releases). The video below shows a hilarious late 80's profile video of the duo complete with matching caricature Robert Smith (The Cure) hair, oversize coloured lens sunglasses, Neil Young tassled suede jackets and skinny jeans (oh for the 80's again!!! ), doing everything they can to explain to the watching world just how normal and nice they are in their finely cultivated laconic 'laid back dude voices' that totally belied the obvious passion they had for their music and their drive to succeed. 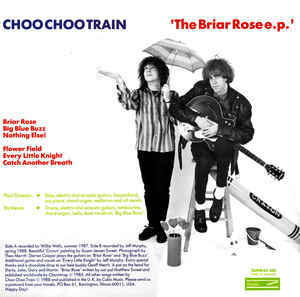 Arguably the best of their pre-Crush jangle inspired output was the superb initial The Briar Road (EP) from Choo Choo Train. This EP had a far more expansive sound deferring the Menck dominated output released by The Springfields (no matter what the credits say, it was always his project having released their initial single Sunflower, on his own The Bus Stop Label, writing the majority of original tracks and performing vocals on them as well), handing the vocals over to Paul Chastain and allowing more collaboration in the song writing with Chastain and the entire band. As such the EP appeals as it seems to visit several different jangle inspired nuances rather than strictly adhering to the sweeter jangle sound that Menck excelled in writing and which lent itself more adeptly to his style of vocals. Chastain's voice had more flexibility allowing for far greater exploration and scope in the sound and in certain cases furtive acknowledgement to the other scenes that were emerging at the time. The initial track , Briar Rose (see below), adds the sort of muted echo that was so synonymous with some of the Baggy/Madchester sound to the vocals with Sally Cinnamon era The Stone Roses emerging as the obvious reference point. It is my favourite track from the release and a sound they were to more fully commit to in their Bag O Shells output a couple of years later. Big Blue Buzz, is possibly the weakest track on the release. It sees Menck return to vocal duty as they give an intimation of what lurked within them, banging out a powerpop / indie rock effort that Velvet Crush fans would eventually like 4/5 years later. However from the melodic perspective that is of paramount importance to the janglepop inspired ethos, it was perhaps the first indication that they would eventually outgrow the genre to some extent. Flowerfield (see below), is basically a return to all things The Springfields. Sweet vocals (albeit Chastain's), chiming guitars and melodies flowing out of every orifice, It is the perfect antidote to the pre-ceding track. It takes its rightful place on every janglepop 'best of' playlist because it would just be incredibly rude not too! The final noticeable janglepop nuance visited is everything all 1960's pop that the pair have always confessed a love for with the EP culminating in the beautifully melodic Every Little Knight and the REM type Catch Another Breath (see below). Menck and Castain have a lot to be proud of and still continue to produce some fantastic music together adding to a catalogue that spans over 30 years, however for sheer vibrancy and freshness of sound this EP is still among their strongest works.